This new open access paper from Li et al may be of interest. 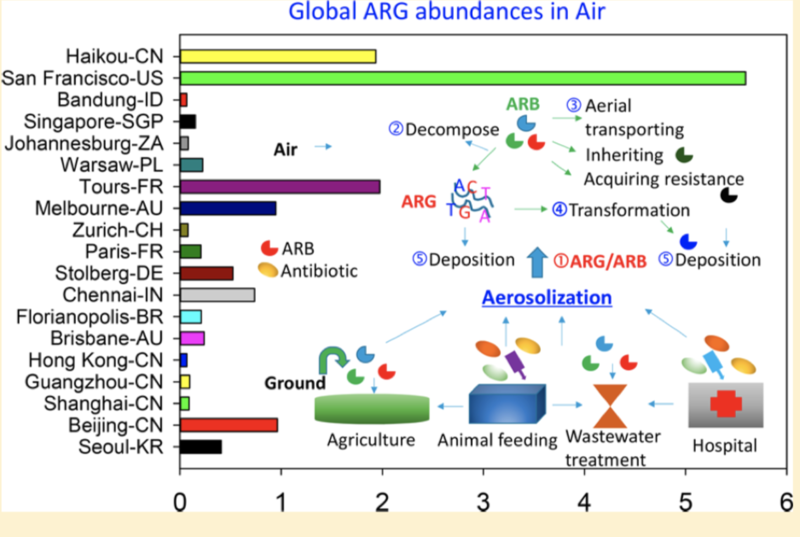 Global Survey of Antibiotic Resistance Genes in Air. It is unclear what the exact implications of these findings are but certainly the presence of such genes and the distribution of such genes across the globe might contribute to the spread of antibiotic resistance and is worth keeping an eye on. I’m curious about the airborne quality. What inspired the testing of air? Are such bacterial strains normally found in air? In such concentrations? I know that there was a statement in the paper about pollution in cities allowing more airborne particles because it provides more surface area to adhere to. But how do these guys become airborne in the first place?